After the slave revolution, the Haitian Elite or upper class was comprised of Haiti Military class, Haiti's Mulato class and free Blacks. This picture is the lovely wife of Emperor Faustin Soulouque, Adelina who is a member of the Haitian elite class. 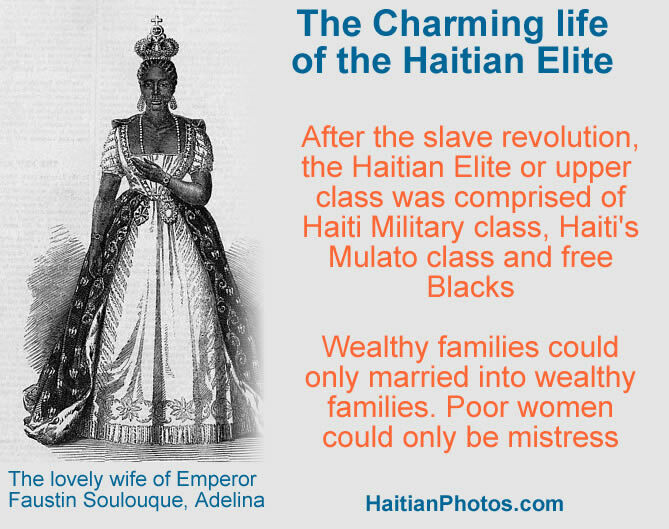 The Haitian Elite or upper class is always comprised of Military class, Haiti's Mulato class and free Blacks. An estimate suggests that about 1% of the total population, constitute the Haitian bourgeoisie--an elite group that the world rarely focuses on. They are often related through years of intermarriage and business dealings. They are educated, worldly, multilingual and rich, sometimes exceedingly so (about 300 are millionaires). A few of them are black, some are white, and most of them are mixed who have separated themselves from ordinary black Haitians in every respect. Pétionville's discothèques, casino, and health spas are packed on the weekends with affluent Haitians-- it is where you can witness the disparity of Haiti's wealth. The society is trapped in cycles of poverty, corruption and exploitation. Some of them have prospered mainly in the import-export or textile businesses. One percent of Haitians control 50 percent of the country's economy, and its top 500 taxpayers generate 80% of its tax revenues. In 2013, Haiti had a GDP of $8.199 billion, and 95% of that was roughly in the hands of about 10 families (eleven or twelve extended families in Haiti, many of them linked through marriage over many generations). 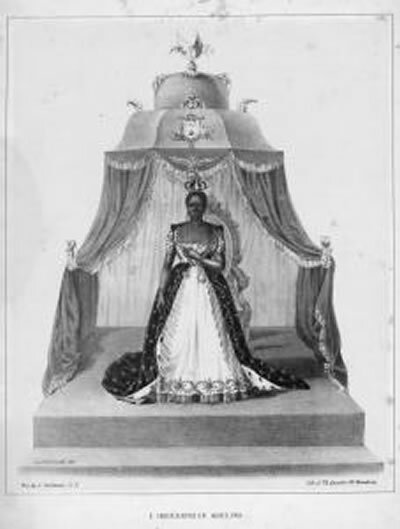 Adelina Soulouque, Empress of Haiti, was crowned in Port-au-Prince beside her husband Faustin I, given the royal name Her Imperial Majesty. She was born to bi-racial Haitian mother, Marie Leveque. Adelina was Faustin I's lover for years before she married him, giving him a daughter, Princess Celita. Faustin was overthrown by General Geffrard in 1859. Adelina went into exile with him in Kingston, Jamaica for eight years before he died back in Petit-Goâve. Here is the Emperor of Haiti, Faustin Soulouque as Faustin I. 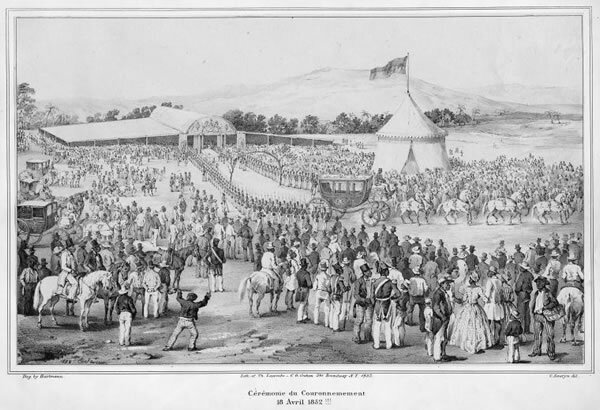 A former career officer and general in the Haitian Army, was proclaimed Emperor of Haiti under the name Faustin I. Once Soulouque had conquered the Boyerists he decreed himself Emperor Faustin I with Parliament's approval. In office, he adopted an attitude of suspicion toward Black leaders he thought were conspiring against him. 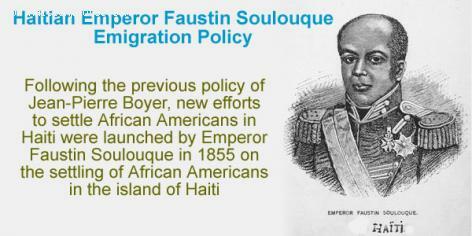 Faustin's foreign policy was to protect Haiti and Santo Domingo from foreign interference. He tried without success to annex Santo Domingo to unify the island of Hispaniola. Defeated after his final attempt he came back to Port-au-Prince. He was losing power, with no progress being made in Haiti, and his reputation as a merciless dictator furthered his decline. In 1858 Fabre Geffrard managed a coup d'etat and became president. Faustin went into exile in Kingston, Jamaica where it was widely reported he died. But Haitian historian MacLeod writes Faustin actually died in Petit-Goâve. Faustin Soulouque came to power as Haiti's president in 1847 when the mulatto-elite Boyerists recruited him after President Riche passed on. He was seen as old, lacking authority, and weak-willed. But the Boyerists were proven wrong when Soulouque, after bowing to their authority, staged an overthrow, was appointed president, and quickly set about massacring them. Soulouque was born as a slave circa 1782 in Petit-Goâve, but became a freed man later. To assure his freedom, because the French were trying to force slavery on the Haitians again, he joined the Black revolutionary army. He was part of the revolt driving the French out of Haiti, staying in the military until the unsuspecting Boyerists selected him as president. 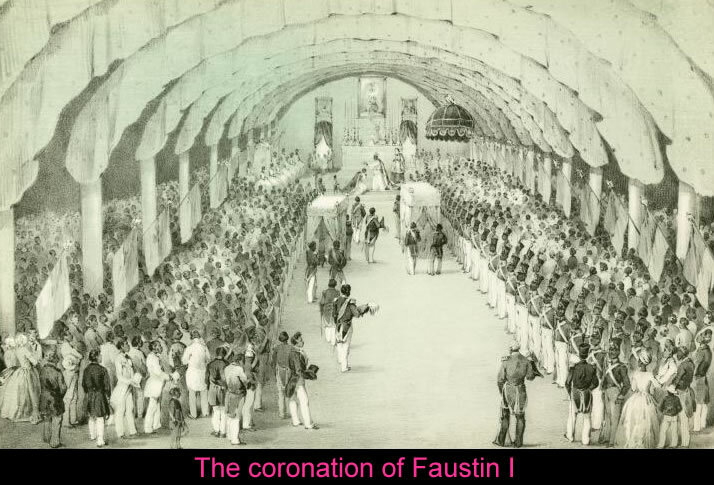 Here is a picture of the coronation of Faustin I. In 1849, Faustin Soulouque was proclaimed Emperor of Haiti under the name Faustin I.
Soulouque ascended the ranks of the Haitian military over the next forty years, ending up as Lieutenant General and Supreme Commander of the Presidential Guards. When President Riche passed away in 1847 the Boyerist ruling class needed another figurehead as president. They picked Soulouque, thinking he was unintelligent and ill-informed. Soulouque did their bidding at first but turned on them and declared himself a dictator. 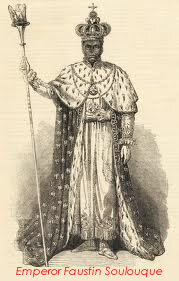 He began a campaign of genocide against the mulatto-elites, and in 1849 Parliament decreed Soulouque Emperor of Haiti, Faustin I. 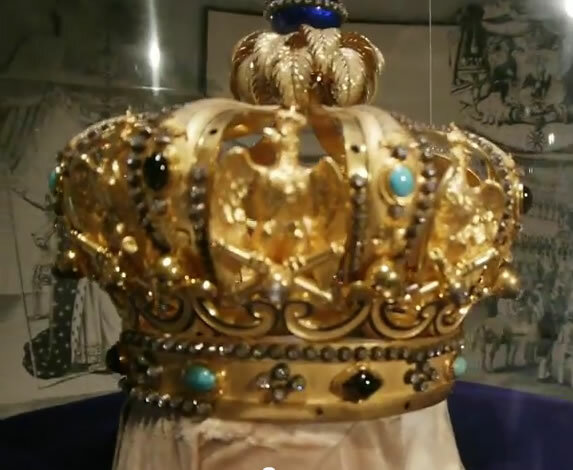 Three years later he and his wife Adelina were crowned Emperor and Empress. Faustin protected Haiti's sovereignty from foreign threats and unsuccessfully tried to divest the Dominican Republic of theirs. In 1846 military leader Fabre Geffrard staged a coup d'etat, driving Faustin into exile, becoming the next president. Faustin was exiled to Kingston, Jamaica and many believed he died there. But historian Jacques Leger claims Faustin died in Petit-Goâve, having snuck back into the country. Faustin Soulouque, an officer of the highest rank in the Haitian army, defied expectations and became a Haitian president, who knew how to take and hold power during his rule. Soulouque was born in Petit-Goâve in 1782 a slave, but later gained his freedom when the Saint-Domingue Civil Commissioner abolished slavery due to the slave revolts occurring then. However the French government tried to reinstitute the practice of slave ownership, and Soulouque, in an attempt to hold onto his freedom, signed on with the Black revolutionary army. Emigration Policy toward African American.